*Began with watercolour on Cold Pressed, 300gsm Arches watercolour paper. Then dabbed freehand with my finger, some art app media, in the Procreate app. Available here, as a “Art – Postcard” print, “20cm x 15cm”. This is Bob, one of our dogs – Jack Russels – sitting on the couch. Probably hoping to hear those favourite words, “want to go for a walk”. 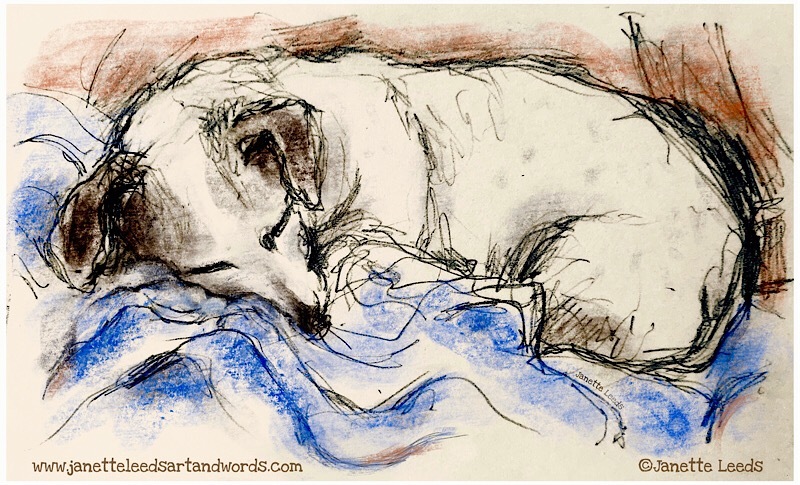 Below is our other dog called Seth….sleeping – they do a lot of that, as they are both getting on in years. I worked from some quick sketches, and managed a photo of Bob before he moved. In both images I’ve worked on them further in the “Procreate” app. This began as a small graphite pencil sketch on paper, then I took it into “Procreate” and added some colour freehand, with the “artist crayon”. 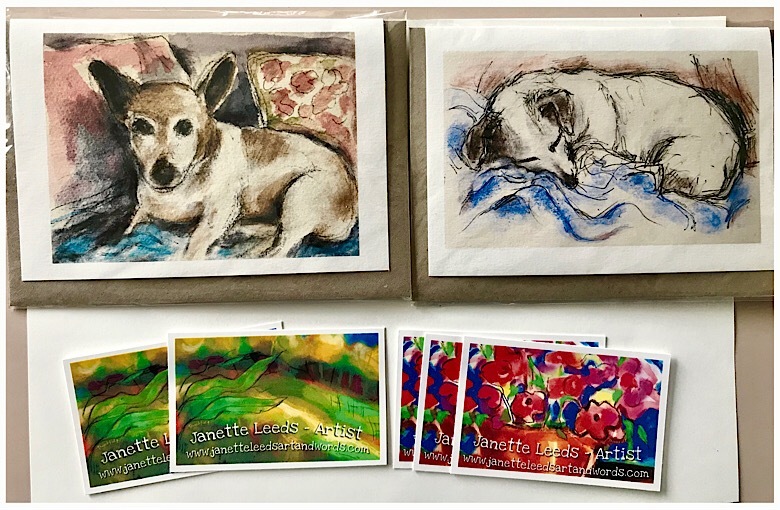 I decided to print and make cards from the artwork; adding to a growing selection of images I use when producing my cards. *More info of the processes under the pics. 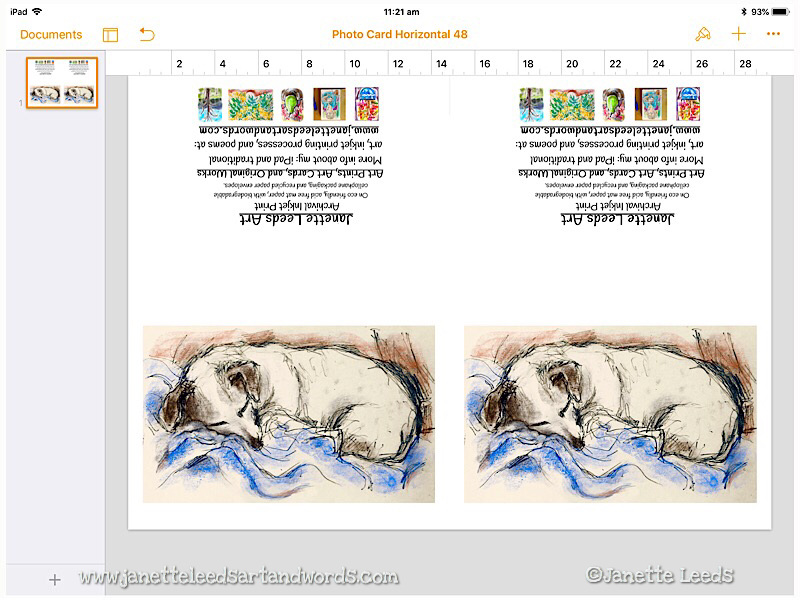 I arrange the image onto a template in the “Pages” app, and also place some words on the back. I arrange some words and tiny pics for the back of the card in an app called “Book Creator”. Then bring the finished design into “Pages”. Before printing my art (and taking them into “Pages”) I make some colour and tonal adjustments to the images, in the Photo section of my iPad. Over time I’ve learnt how the image on the screen needs to look to make a good print; also I take into consideration the paper I choose to print on. I’ve discovered the paper I use, will have a huge impact on how well the print turns out. For my cards I use Canson 220 drawing paper. It has a lovely texture and weight for cards – and for larger prints. For my “Art – Postcards”, (not foldable), I use a matte, lovely lightly textured heavier paper: 300gsm. 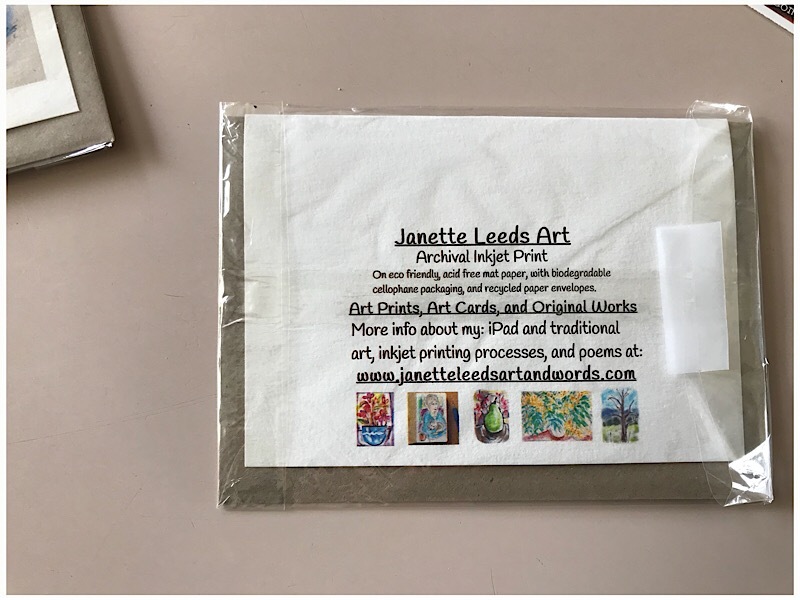 Though it may be difficult to read here, you can probably see I mention using eco friendly paper and packaging for my cards. *I’ve since changed the wording a little, and taken off the pics at the bottom. Below the cards are “bizzo” cards, as I call my home made business cards. I place the images of them (the words have already been put on them in the Phonto app) into “Pages”, then print them onto a smooth 270gsm Strathmore Bristol paper. Then cut them out with my guillotine. I have these for sale in my local area, and have some of my art available as art prints, and on various items, in my Red Bubble shop, here. Thanks for viewing my work – enjoy your weekend! Love Bob and Seth, and your artwork is fantastic.